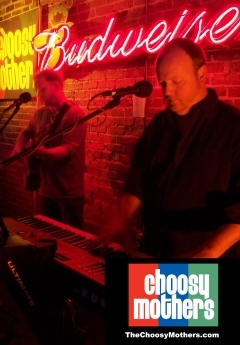 The Choosy Mothers! HotDang! GiddeeUp! and it's the year 2005, then check out our MySpace page. ...and, we bet THAT duo would be AWESOME! Anyway, The Choosy Mothers are Tom and Carl: Dudes from various bands that have knocked around Central Florida (and beyond) for longer than it would behoove us to recall. Depending on who you ask and how you count, we more or less assembled in late 2002. We specialize in finding the groove in just about every kind of music. Our job, as we see it, is to get you to shake your booty regardless of the rock, the funk, or the soul. Stay tuned for more info, a website overhaul, and new sections including historical data on all of the former members of various incarnations of The Choosy Mothers, new demo songs, previously unreleased gig photos, indictment documents, and new calendar listings. Click HERE to see the OLD Choosy Mothers website! For booking information and/or to join our email list, please click on the email address below. (Please leave the text 'For Real!' in the subject line so we know you are for real! You can add any other subject text that you'd like after the 'For Real!'... ).